Headquartered in a lounge on the Near North Side of the Windy City, the Tesa Cigar Company is led by Chicago native Chris Kelly. Chris is an “atypical” cigar maker who meticulously creates blends from Tesa’s own factory in Estelí, Nicaragua, with a variety of enticing wrappers and filler tobaccos from Nicaragua. His offerings include the Shaman, Series Finos F500, Havanitas, Gran Cru, and the Vintage Especial (third on our list of the Top Ten Cigars We Reviewed in 2009). 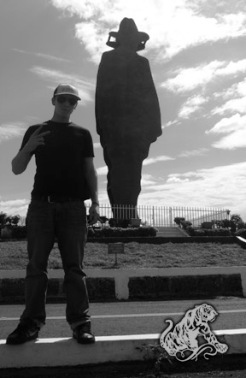 Chris—pictured in front of a national monument for Augusto Sandino in Managua, Nicaragua—recently spoke with StogieGuys.com about mastering the trade, the challenges of working in another culture, and what sets Tesa apart from the competition. Stogie Guys: You don’t look like the typical cigar maker. Your age, your base in Chicago…What gives? How did you get involved in the industry? Chris Kelly: I am the atypical cigar manufacturer. I’m a 24-year-old Irish kid from the South Side of Chicago. I was blessed to grow up in the cigar business, as my father has had a cigar store there for almost 30 years. I have spent the better portion of my life from infancy to now around cigars and cigar smokers. Needless to say, they have become my life’s passion. My father has always been ahead of industry trends and in the early 90s he began taking trips to Nicaragua with the Padróns and Perdomos. While there, he developed a relationship with a small factory and began having brands made for his store. A couple years later we began wholesaling product. When quantities went up we ran into problems. I couldn’t sell bad cigars. My father bought a building in Nicaragua and offered to let me make cigars. At 18 I said, “Hell yes!” and have been doing it ever since. SG: In terms of blending and cigar production, what sets Tesa apart from other manufacturers? CK: We’re unique in our blending. When I was learning to blend, the level of guidance from experienced people was about zero. This industry is very family-oriented for the most part and so great-grandfathers pass their knowledge of tobacco down to grandfathers and then fathers and so on. I had none of that generational knowledge passed on to me, which made my start in blending and manufacturing a very difficult task. When I began in Nicaragua, I was a cigar smoker and that was it. Just about zero Spanish, one or two contacts in the country, no raw material knowledge, no processing knowledge, blending or construction knowledge—let alone how to deal with people from another culture. That was an awful lot to take in at 18, but this was what I wanted to be. I wanted to be a tobacco man. I was forced to approach everything thinking outside the box. This has helped define both our cigars and our company. It has also cost quite a bit of money from my earlier ignorance. SG: What are some of the biggest challenges in making cigars the way you do? CK: The biggest challenges are definitely with tobacco, both availability and the lack of deep pockets. We had some serious availability issues to overcome for the first two and a half years. Finally, I was permitted by tobacco growers to purchase Grade A tobaccos. Those tobaccos were just “not available” to me in the beginning, which forced me to be totally involved in my manufacturing process. A lot of oversight is needed with “workable” material and not top grade. That practice has become a part of why we’re different. SG: What was the most difficult Tesa line to blend? Which line is the best-selling? CK: Each blend has had its peculiarities that we’ve run into, every single leaf of tobacco is different, and tobaccos react differently with other tobaccos. The difficulty level becomes a major factor when you’re driven to make a cigar that is complex, well-balanced, rich, and well-constructed. That is very difficult. Right now our best cigar is a toss-up between the Cabinet 312 (a nice medium-full body with big and dark flavors of espresso, bittersweet chocolate, with fleeting hints of citrus) and the Vintage Especial (a mild-bodied Connecticut with a very creamy texture to the smoke, subtle yet intricate flavors of almonds and butterscotch—very complex for a mild blend). SG: How long have you had a lounge in Chicago? What sort of surprises does that enterprise present? CK: We have had the lounge in Chicago for about a year and a half. The biggest surprise to me has been people’s gravitation to the lounge. Obviously, in opening the lounge I anticipated customers, but there is a wonderful energy in that place. People don’t want to leave and, when they do, they’ve already planned when they can come back. We have created upwards of 100 new cigar smokers out of that store. Twenty-something’s think it’s the coolest thing they’ve seen. They stumble in looking for cigarettes and say, “Wow, what’s this all about? I didn’t know people still smoke cigars.” More women frequent our lounge than I’ve seen in many cigar shops. The synergy of people is top shelf. The lounge is critical for the longevity of this industry and society as a whole. SG: Regarding your factory in Estelí, how is doing business in Nicaragua different than doing business in the U.S.? CK: Doing business in Nicaragua is very different. You are dealing with a different culture in a foreign language. It took a considerable amount of time to hone my diplomacy and people skills to work side-by-side with them. You have to understand the people, their history, beliefs, and ideals before you can begin to relate to them. It’s very humbling to be working down there; save Haiti, it’s the poorest country in our hemisphere. To be there on a daily basis seeing what true poverty is and understanding what that means to the person who is impoverished is truly life-changing. The Nicaraguan people are wonderful and very strong. SG: What would you say to those readers who have never tried a Tesa? CK: Why not try a Tesa? I smoke what I make and I work very hard to bring to market a superior product. It may not become your favorite, but I personally guarantee that it will be a very enjoyable experience for you. It’s difficult to get people to try products from a new company, but we’re not new. We are the best kept secret in Nicaragua and the industry. Give me a shot at your taste buds. SG: Aside from your own creations, what else do you smoke? CK: Right now, I’m smoking quite a few Ligas from Drew Estate—both the Number 9 and the T-52s. Personally, aside from my products, I think it’s one of the most under-appreciated sticks out right now. Great flavor, complex, lots of depth, and the construction is excellent. Other than that, some Pepin stuff here and there, the Davidoff maduro is a nice smoke, and some other odds and ends. Many thanks to Chris Kelly for taking the time to speak with StogieGuys.com. For more information and to order Tesa cigars online, please visit TesaCigars.com. Great interview. Honest, engaging, and informative. It's refreshing to read such a "real", interview, one that doesn't read like advertising copy. Now I need to get my hands on a Tesa! Great interview Patrick and Chris; I've been very impressed w/ the Tesa line and am truly shocked that they are still somewhat under the radar outside of IL. Why not try a Tesa? I'd love to, but ordering them individual from the web site is just….weird. If I order 20 do they come in a box? Any plans for 5/10 packs or samplers? Business brings me to Chicago several times each year. Love that city. Awhile back, based on what I had read on this website, I started making Tesa a regular stop when I'm in town. The lounge is nice and the cigars are nothing short of spectacular. The 312s and the Vintage Especials are downright amazing. Dave, I didn't know could order individual sticks from the website. I think that's a big plus. I'm too indecisive and don't smoke enough to ever buy a box of anything. I do support local shops but sometimes I want to try something specific without hunting for it. So Tesa, thanks for the single sales. I had the 312 a while ago and it had huge flavors. The Series Finos is relatively affordable and a great mild cigar. Tesa Cigars are by far the best cigars I have ever smoked. Chris has pored his heart and soul into making these cigars the best available. Keep up the good work.